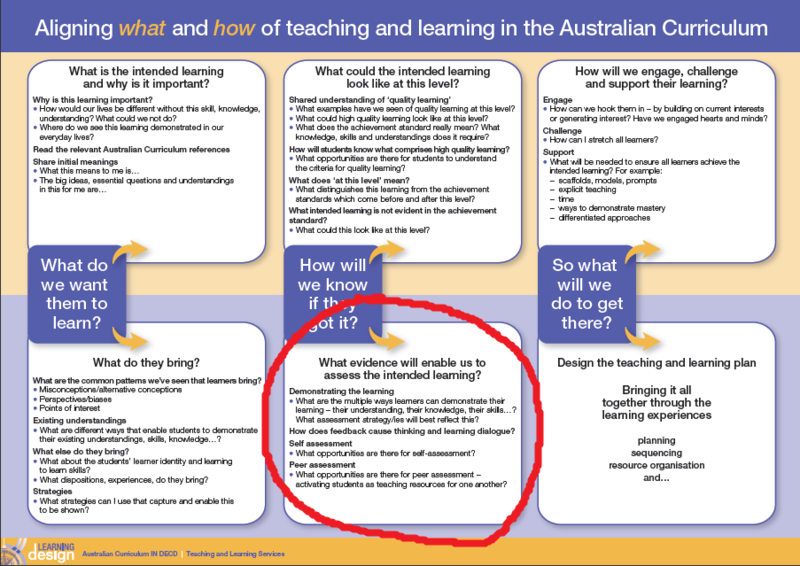 This entry was posted in Learning Design, Pedagogy and tagged assessment, Australian Curriculum, learning design, professional learning. I know this is not the task or response we are meant to outline but this is a short version as a starter after watching the Dylan William video. I really liked the plane analogy about just moving on even if they haven’t reached the desired destination. I know that in the primary classes FORMATIVE assessment plays a vital role in planning the sequence of activities in a topic of learning. I think, from my experience in teaching higher grades that there is much more focus on summative, end of journey tasks than continual bits of information to assess progress. * marking work samples continually through a unit. * setting weekly homework contracts (assignments) to gather info about understanding levels. * Portfolio or “Take Home Book” filled with assessment summaries, work samples, rubrics etc. from the past term. In my teaching of middle school mathematics I use assessment for and assessment of learning, but not as learning. Students have a homework assignment for each unit. When I mark it, if I find gaps in their understanding, then I either work individually with the student, or if several have the same problem, then I will address it as a group or even class. At the end of the end students have an investigation and test which is assessment of their learning. Really, the Research Project, is the one subject where assessment as learning is explicitly addressed. Students need to reflect and analyse the value of the learning which has occurred as a result of undertaking the Research Project. They need to reflect upon the research skills they have gained as well as the value of the particular project for themselves and others. This is worth 30% of their overall grade and is externally moderated.